Recently, and perhaps foolishly, I accepted a challenge from a fellow blogger. Nothing to do with blogging, or even food – instead, the challenge is to hold a plank position for four straight minutes. Our deadline is September, and currently we’ve each managed a bit over two minutes. In a word? Ouch. If you’ve ever done plank exercises, I suspect you’ll feel my pain. A much more pleasant type of planking is the sort you do with fish. 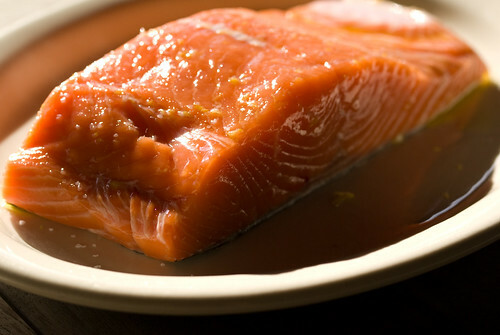 We tried this again recently, with some gorgeous king salmon from Skagit’s Own Fish Market. Planking is a traditional technique in the Northwest, but it’s hard to find fish cookbooks that even mention it, let along give detailed instructions. So we’ve been somewhat making it up as we go along. 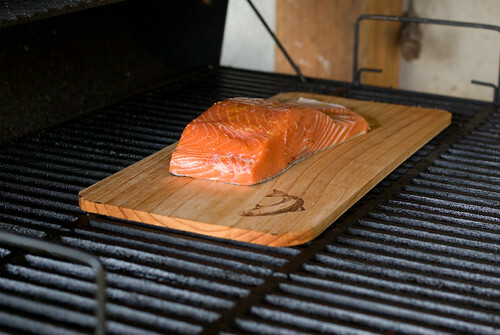 The idea here is to build a fairly low fire in your grill, then lay the fish on a well-soaked cedar or alder plank (you can make or buy these) and position it away from the direct heat, and cover. 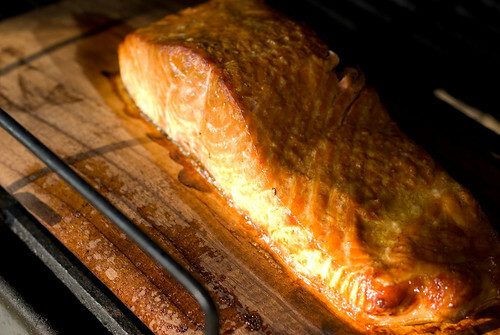 The fish cooks slowly in the smoke, protected by the wet wood, producing very tender, flavorful fish. It’s fine if the plank smolders a bit, but you don’t want it to actually catch on fire – keep a spray bottle handy. It’s supposed to take anywhere from 20-30 minutes, but I think we overdid ours a little – the fire might have been a bit too hot. 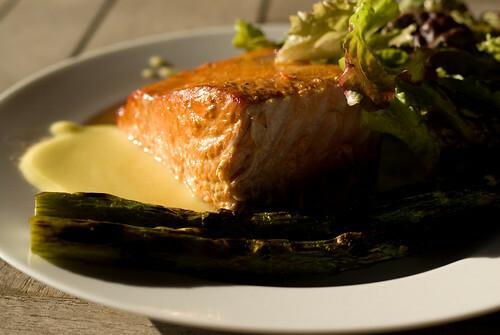 We served our salmon with grilled asparagus, salad and a not-very-successful homemade aioli (it was more like salad dressing than mayonnaise). 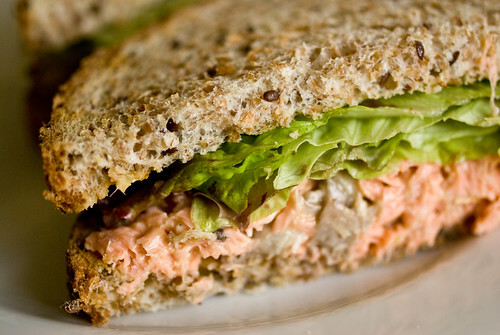 It was tasty enough, and made a rather good salmon salad sandwich the following day. On the whole I’d say this was a good dinner, but had room for improvement. Have you planked, either the exercise or the fish? Any tips? Not foolish! Our cores are going to rock. Now I feel silly though. I never thought about making salmon salad the next day. Of course, we rarely have leftover salmon. But still, I’m so doing that next time. We don’t usually have leftover salmon, but this was such a beautiful fillet we bought more than usual. And the smoky flavor made it really good in the salad. My core is definitely getting stronger, but my arms still feel like wet noodles. Need more practice. Hi Abbie! I’ll have to look up your recipes. Some friends gave us a big pack of cedar cooking planks that are calling out to be used. Planked shrimp sounds like a great idea.